Epiphone presents the new Ltd. Ed. 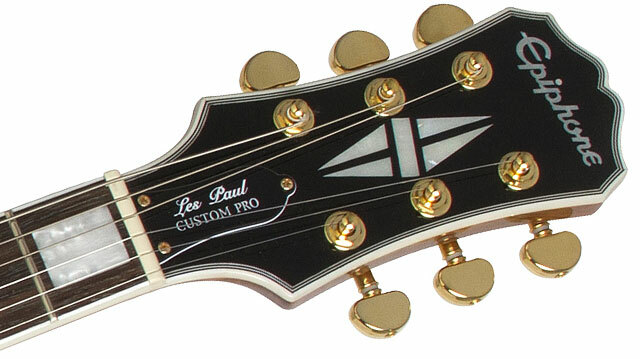 Les Paul Custom PRO KOA. Featuring a KOA top and critically acclaimed ProBucker™ humbucker pickups with coil-splitting plus a push/pull phase control on the neck position tone pot along with Les Paul Custom style gold hardware, fully bound body, neck and headstock, Graphtech® nut, and pearloid inlays. Available for a limited time at select Epiphone dealers only. The Ltd. Ed. Les Paul Custom PRO KOA features a warm, tone-rich figured KOA top with a Natural finish and a traditional solid Mahogany body. Both the body (top and back) and the traditional “Custom” headstock have 5-layer black and white binding. Just like Les’ personal Custom, the Les Paul Custom PRO KOA has a bound solid Mahogany 24.75” scale neck that is hand-fitted and glued-in for optimum neck-to-body contact so the Les Paul Custom PRO KOA resonates as a single piece of wood. The fingerboard has pearloid block inlays, a 12” radius, a 1.68” Graphtech® nut, and 22 medium-jumbo frets. The Les Paul Custom PRO KOA is powered by Epiphone’s critically acclaimed ProBucker™ pickups, a 4-wire design with coil-splitting inspired by Gibson’s legendary BurstBuckers™. Epiphone ProBucker™ pickups recreate the sound of the original hand-wound “PAF style” humbuckers designed by Seth Lover in the late 1950s at Gibson’s factory in Kalamazoo, Michigan. Epiphone ProBuckers™ feature all the same ingredients as original “PAF Style” and BurstBucker™ pickups including Alnico II magnets, Elektrisola magnet wire, 18% nickel silver unit bases and covers, and pole screws, slugs and bobbins manufactured to Gibson’s original specifications. The result is a phenomenal pickup that over time will develop the subtle, one-of-a-kind characteristics that you can usually only find in vintage humbuckers. 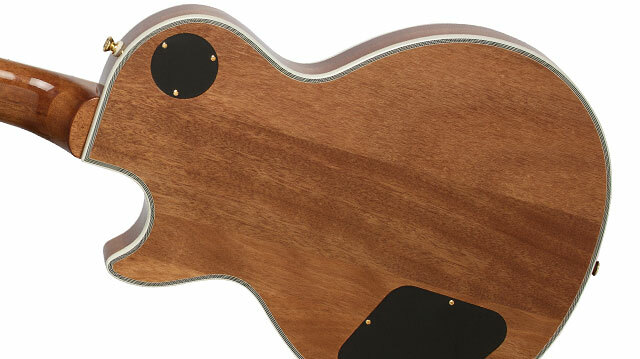 And best of all, those unique pickup characteristics will give your guitar a unique “voice.” No two vintage Les Pauls sound alike and ProBuckers™ will give your Epiphone Les Paul Custom PRO KOA a one-of-a-kind sound that will only get better the more you play. The Les Paul Custom PRO KOA includes a ProBucker™-2 humbucker in the neck position that is slightly overwound for greater definition at higher volumes. The bridge pickup is a ProBucker™-3 humbucker, which is also slightly overwound to give your solos a wide tonal range. 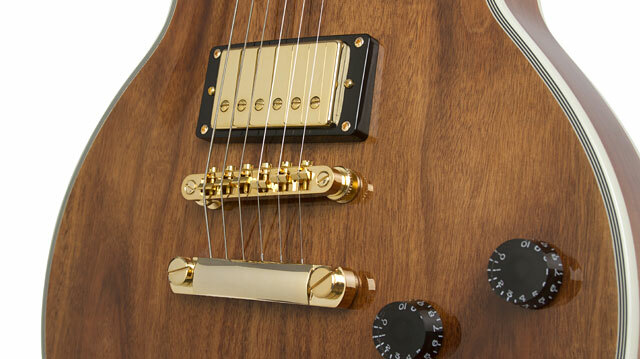 Both pickups feature coil-splitting via a push/pull control at each pickup’s volume knob, which gives the Les Paul Custom PRO KOA the ability to be any guitar you can imagine. Plus, there is a push/pull phase control on the neck position tone pot for even more sonic options. All volume and tone controls feature full-size 500K Ω potentiometers matched with Epiphone’s rugged, all-metal, 3-way toggle pickup selector switch for long-lasting performance. Epiphone’s reputation for making outstanding guitars extends to its unbeatable hardware and the Epiphone Les Paul Custom PRO KOA delivers with a standard-setting gold LockTone™ Tune-o-matic bridge and a gold Stopbar tailpiece for superb tuning stability. Plus, gold Grover® machine heads with an 18:1 ratio for fast and reliable tuning. An optional hard case is also available.